Kenilworth HeartSafe (KHS), part of Warwickshire Hearts, is a town-wide initiative working to make Kenilworth‘ heart safe’. The aims of KHS are: to teach people CPR; to install Automated External Defibrillators (AEDs) in public places so that all homes and businesses are within a short distance from one and to raise public awareness. Their value to the community has been recognised by Kenilworth Lions and Warwickshire County Council, who have both made generous contributions to fund KHS. 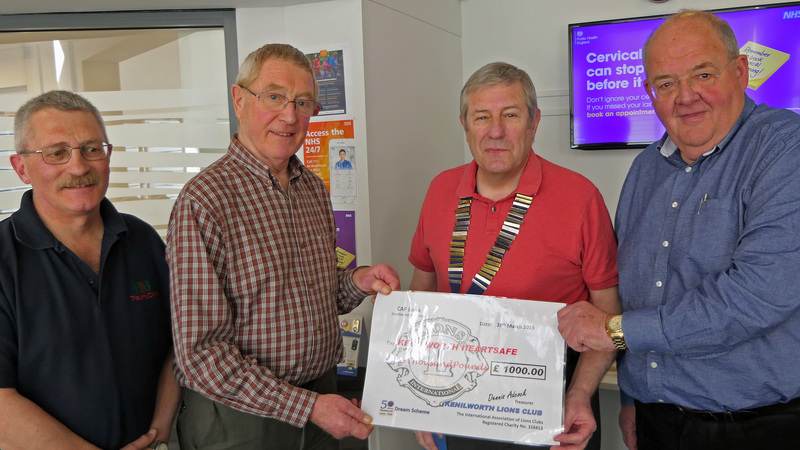 Kenilworth Lions Club have donated £1,000.00 as part of its new Dream Scheme initiative, launched earlier this year to celebrate the 50th anniversary of the founding of the Club. The Dream Scheme sits alongside the ongoing Lions’ programme of grants made to local organisations over the year, and is aimed at making awards which make a significant difference to Kenilworth-based organisations and individuals in realising projects that otherwise might not be achievable. Lions Club President Gordon Henderson said “We have previously worked closely with Warwickshire Hearts, so we’re delighted to be making this grant to help Kenilworth HeartSafe to achieve its ambitious goals. Warwickshire County Council have donated £1,708.00 to KHS as part of its Community Grant Fund Scheme to support local charities with funds for schemes to make life better for local people. · Thursday 20 June 12.30pm -2.00pm. All of the money donated by Kenilworth Lions and Warwickshire County Council will be invested in training equipment for KHS and for publicising sessions. L-R in photo: Nick Shacklock (Warwickshire Hearts), Keith Grierson (Kenilworth Heartsafe), Gordon Henderson (Kenilworth Lions President) and Neil Morris (Kenilworth Heartsafe).